Pi Day isn’t what it used to be in Second Life, but The Exploratorium still celebrates. The displays were generally visual, with one mildly interactive, and I do mean mildly—touching objects in the display gained you some notecards to fill up your inventory. Most of the other spots that came up in a Pi Day search were for dancing this evening. Dancing? I guess I never thought of Pi Day as a reason for dancing, but do you need a reason? Before I went to the Pi Day exhibit, I stopped at Moucault’s Pendulum in Sploland (The Exploratorium is next door to Sploland). I found a lot of blog posts around the web from 2009 that referenced this sight, such as this science post from Jokadia. Nothing much to do at the pendulum, except slow down and wait to see if you will be knocked over. 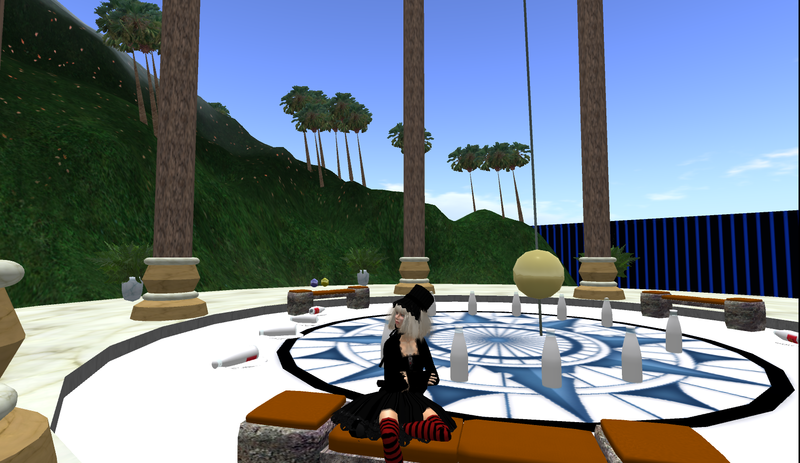 Many places in Second Life are as good as many real life spots for sitting and observing, but they might be a little harder to find. I usually stumble upon them. Why Moucault? I have no idea, unless copyright prohibits using Foucault. These spaces have been around since 2006, I think. I’m both glad and impressed that they continue to be sponsored by the Exploratorium Museum in San Francisco. I added a section to the site that shows the two spaces I built for two institutions of higher education, one island for a small college, and one campus on a leased corner of an NMC island. Neither spaces exist anymore, but the pictures give an idea of how they were or might have been used. It takes both vision and commitment to make virtual worlds work in higher ed. Yet again, I’m going to miss tomorrow’s VWER meeting in Second Life® because of two other meetings. This has happened all too frequently since they changed their US Eastern time. For me, it used to occur just after work, so I could attend at home without being bothered. I try to attend now at work at the new 2:30 PM Eastern time, but that’s such a hot time for meetings that I often have to choose something else. It’s also annoying to try to attend from work because our network is not friendly to virtual worlds and voice is always blocked. But you and I both can look at the transcripts that are posted on the VWER site. Not as good as being there, obviously. So, just for old time’s sake, here are a few pics from my past on the land we used to have at my current institution. A little item I built after being inspired by the General Motors Futurama exhibit at the 1964 New York World’s Fair. Yes there was a 1939 World’s Fair with similar views of the future–I wish I had seen either one of them in person. I think you can tell which one was the model that inspired me. I had much enjoyment from building campuses in Second Life. Thought about that as I sat through the EDUCAUSE Virtual Worlds Constituent Group meeting in Denver tonight–although I was still in Ohio :-( Sorry to hear so many of the old complaints, but in my view, virtual worlds will always be a niche market tool in education, and so what? It’s not the web, even if it turns up in a browser someday. You need a high tolerance for, maybe even an attraction to failure to enjoy working in virtual worlds, and you need a clear purpose and lots of technical and creative support. So what? Here are a few uninteresting photos I snapped at the in-world part of the meeting plus one interesting one from a visit to the MadPea Carneval. Too bad that sound from Denver could not have been piped in world better and too bad that we could not see each other.